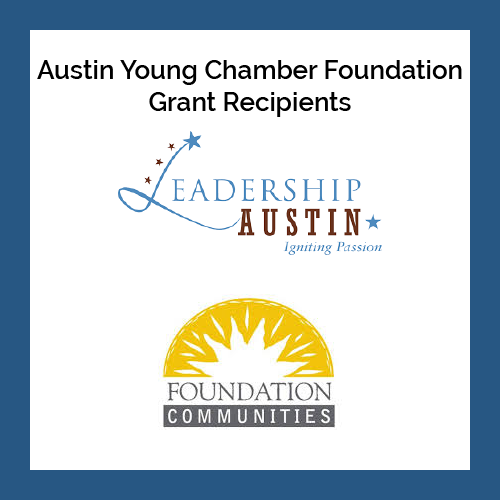 AUSTIN, TX – November 26, 2018 – The Austin Young Chamber Foundation has awarded two additional grants to Austin area non-profit organizations. Leadership Austin and Foundation Communities were both recipients of $1000 grants to support their important work in the Austin community. Each also received a Corporate Membership to the Austin Young Chamber as we hope to learn more about their organizations and give our membership an opportunity to engage with their causes and missions. “We know that before young adults can even begin to think about professional development opportunities like the Austin Young Chamber provides, they have to have secure jobs and have clear paths to success,” Austin Young Chamber Foundation Chair, Julie Smith said. “We want this to be a reality for everyone in our region and we’re excited to bring the Young Chamber community together to support organizations and programs working toward this end,” Smith said. Prior to awarding the two grants, the Austin Young Chamber Foundation helped fund the first ever professional development conference for young professionals in Austin. The LEAD Summit, held February 16, 2018, brought together nearly 300 young professionals for a day of Learning, Engagement, Action and Development. The Austin Young Chamber Foundation also supported the 2018 Central Texas Signing Day event at Concordia University Texas in May where over 1200 seniors from Central Texas area high schools were celebrated for their making a commitment to attend college. The mission of Grant recipient Leadership Austin is to provide leadership training to those with a passion for Greater Austin. Today they continue to believe each of us can engage in collaborative, inclusive, and sustainable leadership for our community. The grant award funded the Emerge program for one Opportunity Youth participant. The mission of Foundation Communities – College Hub program is to empower and support those who face barriers to higher education so that all students in central Texas have the tools to realize their goals – from application to graduation. Thank you to our donors who made our 2018 AYCF grants possible. The Austin Young Chamber Foundation looks forward to continuing to support non-profit organizations in the Austin area with financial support, volunteers, Young Chamber memberships, and advocacy. 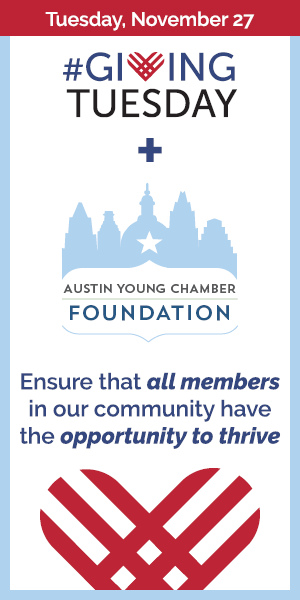 The Austin Young Chamber Foundation is a fund of the Austin Young Chamber. The Young Chamber promotes the economic interests of the Central Texas business community through initiatives and efforts designed to build and strengthen our young professional workforce. Connect with the Austin Young Chamber on Twitter, Facebook, or LinkedIn, or check out upcoming programs at austinyc.org. This Giving Tuesday, please consider supporting the Austin Young Chamber Foundation with a one-time or recurring gift.